I have a cat and he has fleas. Took him to vet but still have fleas in house carpet and furniture used spray but didn't work. Vet proposed boric acid. 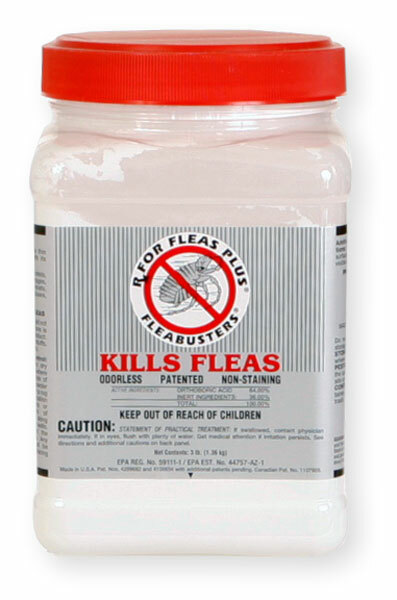 Rx for fleas is a good product for flea control. It does not kill adult fleas however. It only kills the immature flea larvae. Fleas go through a life cycle like a fly - egg, larvae, pupae and adult. Boric acid will only kill the flea larvae. So if you use this product, you also need to use something to overspray to kill the adult fleas such as Ultracide, Alpine Flea Spray, Precor 2000 Flea Spray, etc. Before using this product, be sure to vacuum all of the carpet extremely well FIRST, then apply the RX For Fleas by sprinking over the carpet. I light sprinkle will do. Then use a carpet rake and rake it in until you cannot see it. Do not Vacuum for at least 2 weeks. Rx For Fleas works great and gives long term control. Hope this helps.